The latest Iron Craft challenge was to "Make a project using a technique, material or subject that begins with the letter D." So of course the first thing I thought of was to do something dance related... I remembered seeing some blinged out dancing shoes on Pinterest and decided I'd go with that. I went to Pinterest to find the original pin that sparked my interest and instead I found a different pin with framed shoes covered in pink glitter. They were absolutely gorgeous and I was just about to start planning my sparkle shoe project when I remembered I hate working with glitter! Not only does it get everywhere while you're working with it, but it continues to spread the sparkle 'joy' forever... 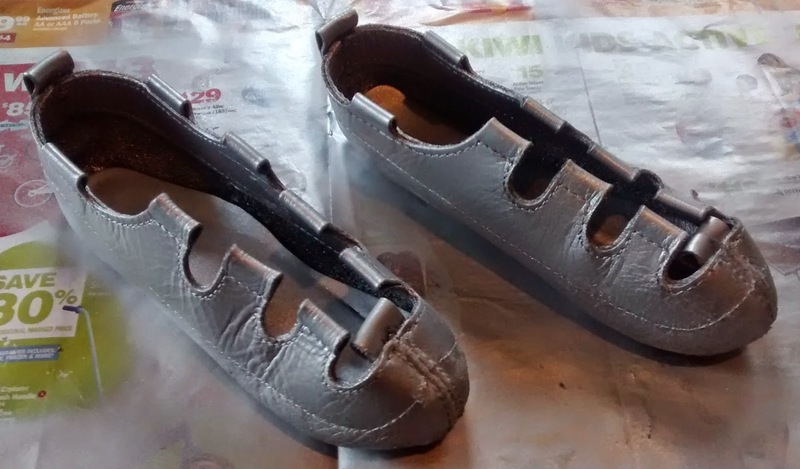 I knew that the finished shoes would end up hanging in the little miss' room, and I could just imagine them spreading their 'joy' all over her room - and not in a good way! So I went back to the original idea of blinging them out with crystals. New Irish dancing shoes are not cheap, but the little miss had a pair that no longer fit her that were in decent enough condition, so I decided to use those. They had been taped up a bit at the toes and on the bottom as they had been her busking/outdoor preforming shoes, and once I took the tape off the finish wasn't looking too hot anymore. So instead of polishing them up I spray painted them silver (as I coincidentally had a little bit left over from a different project). 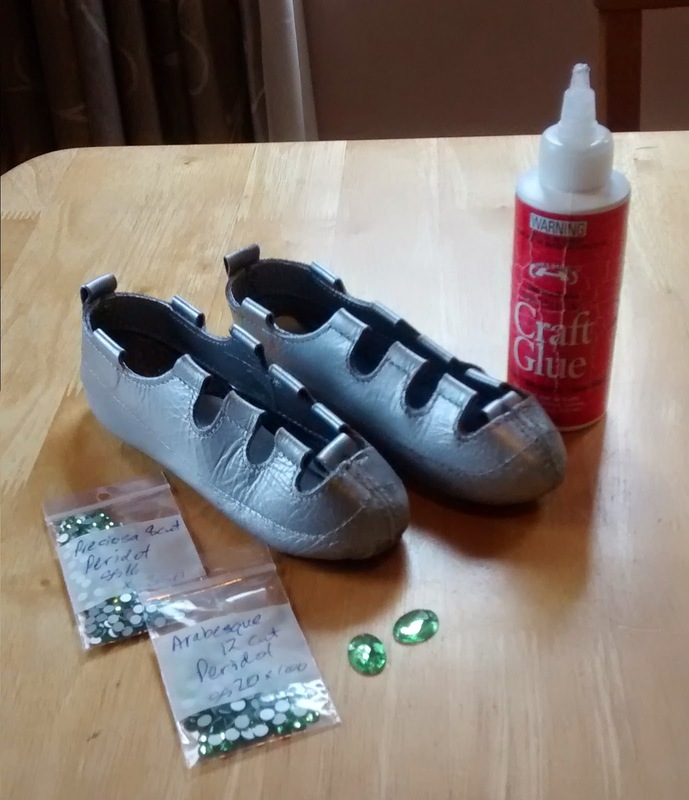 After two coats of spray paint the shoes were ready for blinging! 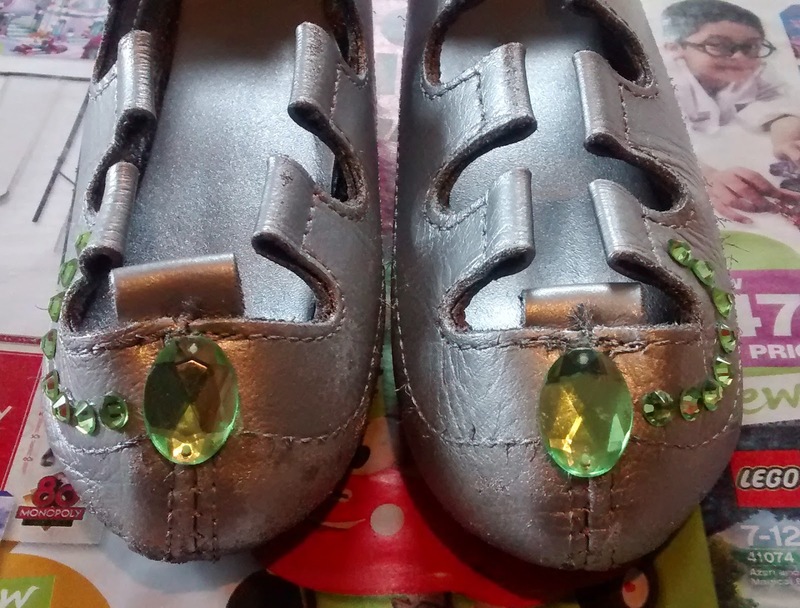 The little miss wanted the shoes to be green, of course, so I went to my favourite online bling shop (Rhinestonz & Beads) and started perusing the green crystals on offer... I didn't want the finished shoes to be too dark, so decided on peridot. Because it's just a craft project and doesn't need massive stage sparkle I went for the options that were budget friendly. 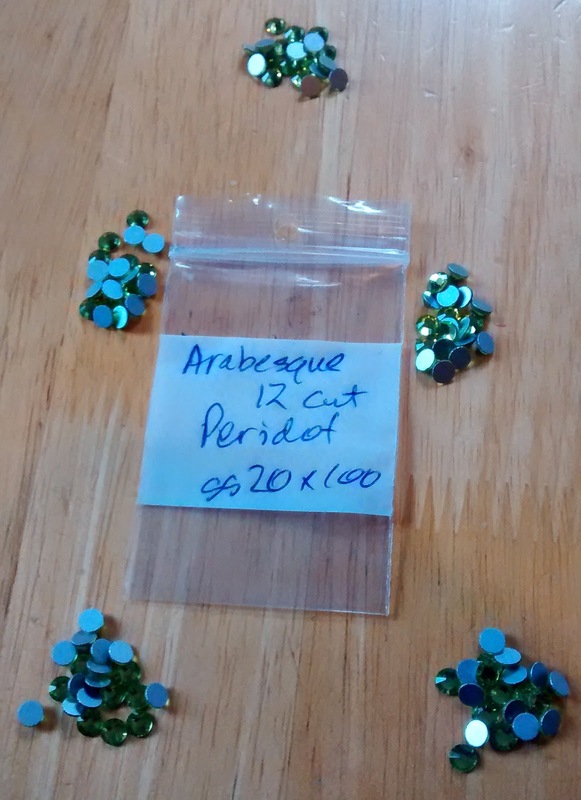 I went for a 350 pack of Perciosa 8cut ss16s (they were on clearance), 100 Arabesque ss20s, and two larger acrylic accent stones. I used just plain old craft glue as I found it worked better than Gem-Tack (which I usually use for my blinging); as it's tackier and dries quicker than the Gem-Tack. I thought that 452 stones would be enough to decorate a pair of tiny size 8 shoes, but I was wrong. Thankfully I had a stash of crystal Arabesque ss20s to fill in a few gaps! The final crystal count on the shoes was 627. Don't ask me how I ended up using an uneven number, it hurts me to even think that one of the shoes in the pair has one less crystal on it. I had a plan in my head as to the pattern I was going to make with the crystals, but had to make some ad-hoc changes as I went when I realised that my purchased crystals were not going to go as far as I had thought. I was very glad for my fairly sizable stash of plain crystal Arabesques, which not only saved me from having to wait for more crystals to arrive, but also helped keep the cost from getting out of hand. After leaving them to dry completely overnight, I laced them up with some fancy ribbon to match and hung them in the little miss's room. Overall I'm happy with how they turned out - especially for a first try. But the cost of the crystals (even using budget options) was a bit higher than I had hoped. It almost made me think I should have gone back to the glitter idea. Almost. *note: if you want to check out the other decorated Irish dancing shoes I've pinned, you can find them on my Pinterest Irish Dancing board here. Wow, those are fun. I can see why you were worried about glitter. There are some techniques for getting glitter sealed but I think I like your crystal idea more.